Rug professionals say a new rug becomes vintage when it is twenty years old, and a vintage rug becomes antique in 80 to 100 years (the exact timeline differs from dealer to dealer). Does this mean every new rug has the potential to become a vintage rug and antique rug? No. Not every new rug becomes vintage, and even fewer become antique. Here’s why. Many rug dealers have restrictions on what type of vintage rugs enter their stock and which eventually becomes an antique. The baseline criteria for vintage and antique is they must be handmade, either hand-knotted or hand-woven. A high Kpsi – knots per square inch – is often a standard criteria for awarding the antique label. Fewer knots per square inch may mean the rug is still beautiful and valuable but it remains in the more affordable vintage category. 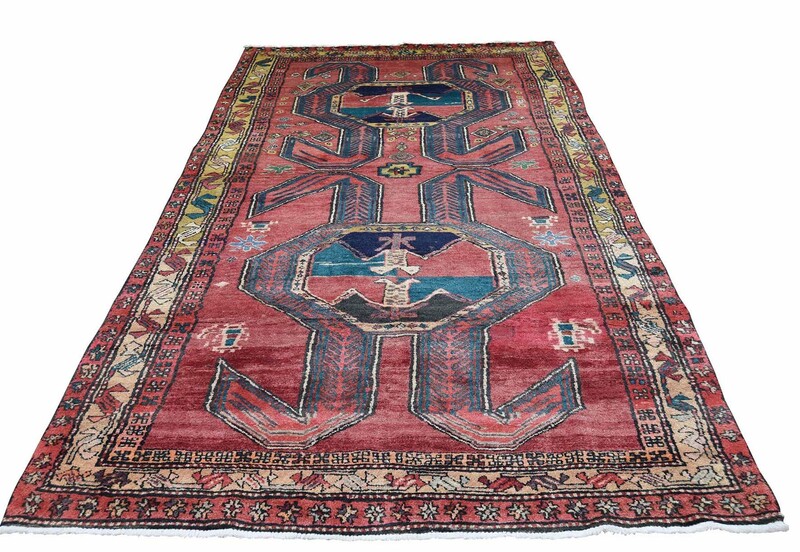 Rarity of colors and pattern can also boost a vintage rug into antique. Antique rugs are usually expensive. Although we do stock a selection of antique rugs, our post focuses on the virtues and affordability of the wide range of new and vintage hand-woven and hand-knotted rugs we stock at 1800GetARug. At 1800GetARug we stock only hand-woven and hand knotted rugs. Handmade rugs are the rugs that change categories from new to vintage to antique. We design our new rugs based on classic and new patterns with colorways that reflect contemporary tastes. 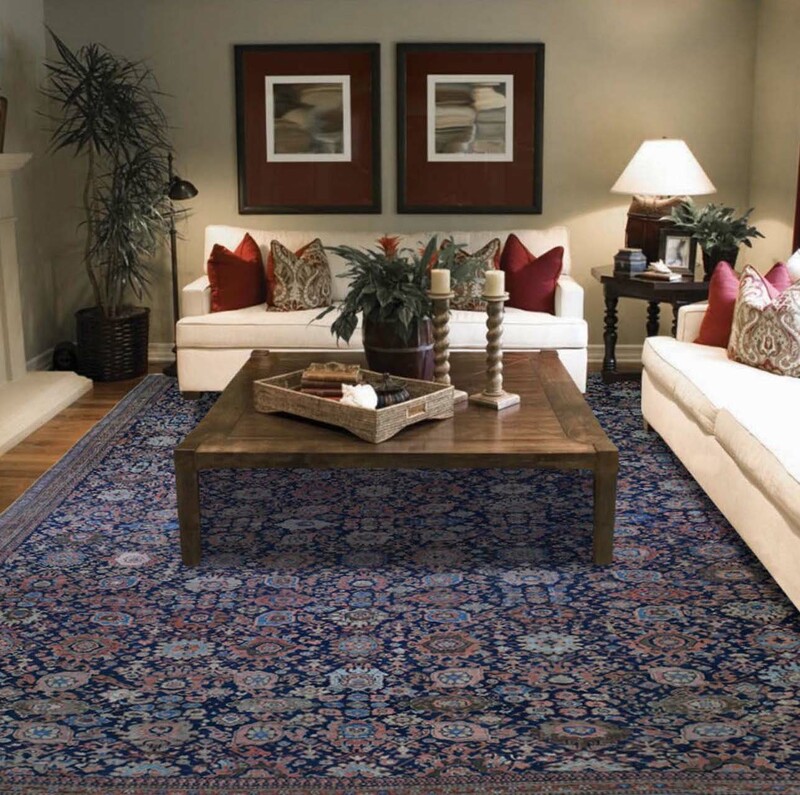 Because 1800GetARug new rugs are always knotted or woven by hand in environmentally-friendly materials like wool and silk, our rugs age beautifully and allow you to pass them on to the next generation as vintage and beloved family heirlooms. Machine-made rugs are often made of environmentally unfriendly materials. Their quality is poor and their lifespan is short. We believe in the value of handmade and being an environmentally-friendly rug company. We support our values by stocking only handmade rugs made from natural fibers. The irony of machine-loomed rugs is that quite often a beautiful vintage rug is less expensive per square foot than an equivalently sized machine-loomed rug. Don’t let anyone convince you that once a new rug becomes vintage it becomes unaffordable. Or that new rugs are better than vintage or vice versa. Each category has its virtues. 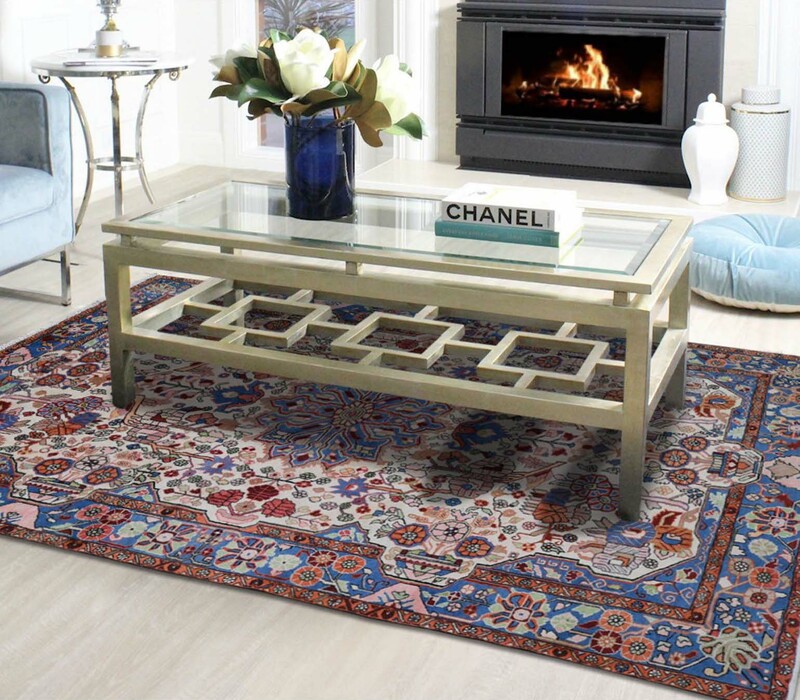 Often vintage rugs will be less expensive than a similar new rug. It sounds confusing, but once you know a few facts you will be able to decide which one is right for your home. Quality of materials, handmade techniques, plus pattern and color are all used to determine the price of a rug whether new or vintage. How many rugs exist of a particular type also determines price. For example, “design-art” rugs are woven in limited editions and are often designed by a famous artist or designer. Their quality and scarcity drives up the price. We don’t stock limited edition new rugs at 1800GetARug, so if you find the new rug of your dreams on our website but it’s sold, chances are we can reweave it for you and even change the colorway. While vintage rugs are a finite resource, this doesn’t mean scarcity is a factor in their price. So many rugs have been woven during the last century that the supply of vintage rugs seems almost inexhaustible. We advise you to be guided by color and pattern. Our new rug collections are modelled on traditional Persian rugs, the ever-popular Arts and Crafts movement, and contemporary abstract collections and more. The colorways of each collection are carefully attuned to contemporary tastes and trends. 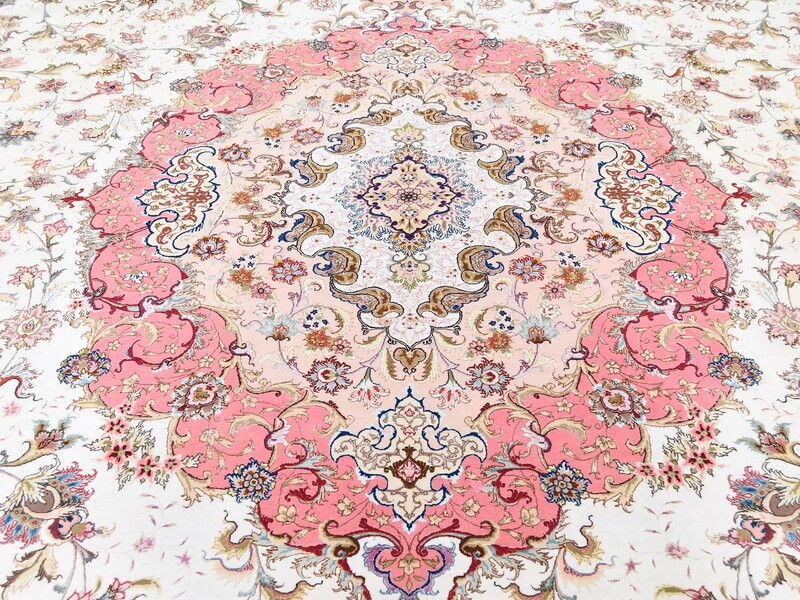 We keep a close eye on design trends and use these trends to guide our vintage rug purchases. Sometimes we decide that particularly busy and colorful traditional patterned rugs (as opposed to tribal and geometric rugs which are popular in their original state particularly for those who love maximalism and jungalow trends) are too overpowering for contemporary interiors. To save these good quality handmade rug from landfill, we overdye the rugs using monochrome colors that produce a vibrant, saturated rug where the pattern recedes and the color takes center stage. These color-rich monochrome rugs are perfect for minimalist interiors. Another myth to bash is that size is directly equivalent with price. While this maxim is usually true for new handmade rugs, it isn’t necessarily true for vintage rugs where a large vintage rug is not necessarily more expensive than a smaller rug. The bottom line? If you are buying from 1800GetARug inventory of more than 10,000 handmade rugs, you don’t need to worry about quality because handmade quality is evident in each and every one of our rugs. We recommend you base your decision on price point, color and design.